AND THEY'RE OFF... On Friday afternoon, Sam and I drove to Fort Wayne, Indiana, for a two-day soccer tournament. After the first game, we drove to Huntington and spent Friday night with friends. After the last game in Fort Wayne on Saturday, we drove back to Indianapolis amid blowing snow in time to get in on Ben Davis High School's "Giant Spectacular." 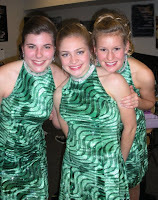 This is a massive annual concert and show choir event that Becky and Molly were involved in. I opted out of the evening "finals" session to prepare for Sunday. Sunday was a double dose--all the prep and leadership for the morning services at the church and then prep and leadership as our congregation hosted a quarterly all-Indy-area Free Methodist church gathering called "Mission Indy," involving a rally and food fellowship. I got home around 10 pm, too exhausted to stay awake to see "Slumdog Millionaire" win an Oscar (yea!). And I didn't even check to see if Levi Leipheimer held on to win the Tour of California (he did--his third consecutive ToC victory; Lance was 7th). UP NEXT. This was a bit unusual for a Hay weekend, but not by much. Next weekend, Molly's at a choir contest in northern Indiana while Sam plays a soccer tournament in Cincinnati, Ohio. Keep up with us...if you can.